Brodick Country Park is located km north of the Caledonian MacBrayne ferry terminal in Brodick, along the main coastal road. The Park is open from dawn till dusk, with the exception of the Walled Garden which is open from 9am to 5pm. The reception centre and caf open at 10am, whilst the castle and reception centre open at 11am. The Stagecoach bus service meets the ferry at Brodick, ask for the Castle Pedestrian Entrance at the Wineport. You can also walk to the Park via the “Fisherman’s Walk” along the beach. This involves walking along the main street of Brodick until Alldays shop, then walking along the beach until you reach a bridge. Taking this leads you through the Saltmarsh (site of the Snowy Egret in 2002!) and across the Golf Course, crossing a large river and then back to the beach. At the end of the strand, you’ll head back inland to a final bridge which eventually goes back to the road and signs to the entrance. By car, follow signs north to the Castle and take the main drive after km, up to the reception centre. Merkland Wood is a further half-mile from the Castle entrance and has limited unofficial parking places. The Country Park covers around 200 acres of woodlands, pasture, meadows, access to seashore, ponds, woodland gardens and formal gardens. 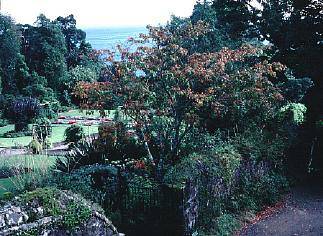 It encompasses the largest piece of mature broadleaved woodland on the island. The Park is also surrounded by Forest Enterprise land, through which the park trails run. This is mainly conifer plantation, but also contains some mature Oak and Beech woodland with Scots Pine and regenerating Birch. Parking at castle and ranger centre. One woodland trail designed for wheelchairs. Refer to NTS web site for details. 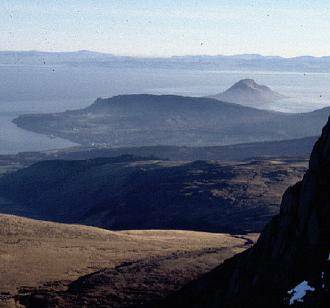 Being an island, Arran is a curiosity as much for the birds that are not here, as much as for those that are. Woodpeckers are entirely absent from Arran, even though suitable habitat exists and they are present only miles away on Kintyre. The Park is a great place to see Barn Owl , with a pair nesting in a nest box in the gardens. Arran is one of Britain’s strongholds for these birds, as it is for the Hen Harrier which can be seen hunting in the pastures during the winter as well as more frequently up on the moorland. The Nightjar is an elusive possibility on midge ridden July nights. Although breeding status is unknown at present, they bred in good numbers during the 1990s in the newly cleared forestry areas. A good selection of seabirds and waders can be seen along the coast from the beach up to Corrie. Shelduck breed in this area, Redshank and Curlew are frequent, as are Common Sandpiper . Gannets from Ailsa Craig perform off the shore from as early as February, and Eiders and Red- breasted Mergansers are a beautiful autumn and winter sight. All the cliff-nesting seabirds frequent the Clyde with Guillemots , Manx Shearwater and Tysties ( Black Guillemot ) being great sites from just offshore. In spring, there is a good chance of seeing all species of Diver , though only Red- throated breed on the island and these can be heard flying over the castle returning to upland lochs. In these days of ever declining Song Thrush populations, they thrive in the mixed habitats of the park. Winter is a great time for Fieldfares and Redwings that feast on Arran’s abundant berry harvest. Bullfinches are frequent visitors to the gardens, pinching out fruit tree buds and seem to like Escallonia bushes which are a favourite wind tolerant shrub. Siskins abound in the park and are a feature of the less promising coniferous areas. Strangely enough, the north of the Island has quite a different bird life to the south, with species like Yellowhammer and Whitethroat being almost absent from the former whilst being regularly heard in the more gentle south. The woodland is great habitat for Wood Warbler, Blackcap and Spotted Flycatcher . Occasional sightings of Pied Flycatcher have occurred and nest boxes have been erected in the open woodland to encourage a pair to stay one day. Buzzards are seen all the time as are Kestrels and Sparrowhawks . Arran is superb for raptors in general, except for the Tawny Owls which inhabit the Country Park, as all of our island inhabitants are male! Other wildlife attractions in the Country Park are the Common Seals that bask on the shore, sightings of Basking Sharks all around the coast and the Red Squirrel , which is not threatened by its American cousin and which, can be easily seen. There are no Foxes, Roe Deer, Stoats or Weasels on Arran, though we have a very healthy population of Otters and Badgers . There are three main trails in the Country Park, which take around 1-2 hours to walk each. There are beautiful waterfalls and views along these routes as well as features of historical and geological interest. You are free to walk almost anywhere in the Park, exploring the fields and woods. Extensive habitat restoration projects have been undertaken to limit the spread of Rhododendron ponticum and we are hoping to restore parkland and agricultural habitats in the future. The park is a great day out for all the family, with a child friendly castle which has lots of children’s activities, a world class garden, an adventure playground, nature room, restaurant and shop. The Ranger Service leads guided walks from Easter to September and hosts other family events. There are maps for garden orientation and trails leaflets. A brand new audio wand system provides a superb way to find out more about the woodland garden. This entry was posted in Locations - North Ayrshire on 08-Oct-2003 .